Arthritis is damage to the cartilage in joints. Shoulder arthritis occurs when the cartilage starts wearing down on the ball and/or socket sides of the shoulder joint. Symptoms of shoulder arthritis may include pain in the shoulder joint, stiffness and reduced range of motion. There are many nonoperative treatments for shoulder arthritis, including stretches, lifestyle modifications, application of ice or heat, and medication to control the pain. Surgical options, such as shoulder replacement, are available to treat shoulder arthritis if nonoperative treatments don’t offer the desired relief. Shoulder arthritis is damage to the cartilage inside the shoulder joint. The shoulder has two joints. Shoulder arthritis commonly refers to the bigger ball-and-socket joint named the glenohumeral joint after the bones it connects (glenoid and humerus). The cartilage covers both the ball (the humeral head) and the socket (the glenoid). When the cartilage in the shoulder begins to break down on the surface and eventually in the deeper layers, it’s called shoulder arthritis. 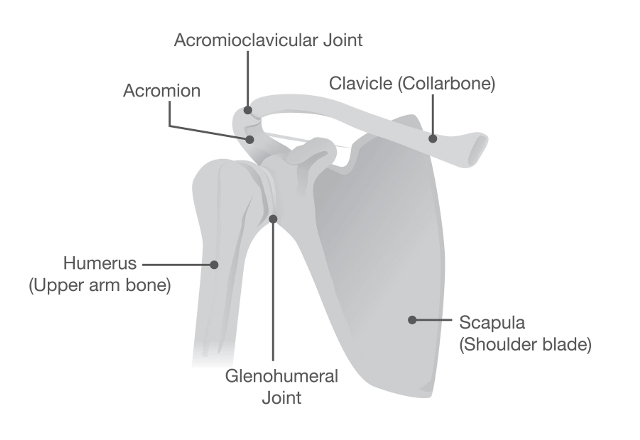 The second joint in the shoulder, the acromioclavicular or AC joint, can also develop arthritis known as AC joint arthritis. How does shoulder arthritis develop? Shoulder arthritis usually results from gradual wear and tear of the cartilage. Cartilage is present in every joint in the body; it covers the surface of the bones inside the joints similar to Teflon on a ball bearing. Cartilage is a living tissue 2 millimeters to 3 millimeters thick — about the thickness of one or two layers of cardboard. This makes the contact between bones softer. If the cartilage is intact, it can take multiple rotations with no wear of the surface because it’s smooth. Shoulder arthritis typically develops in stages. 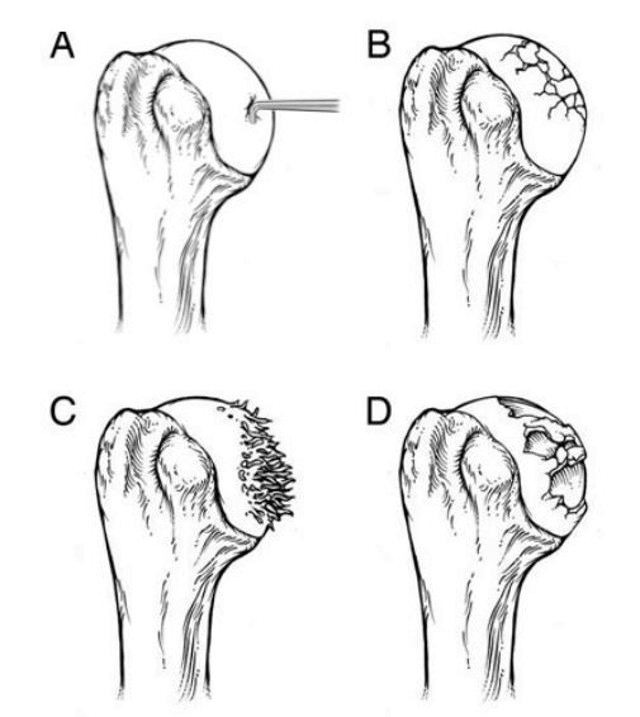 First the cartilage gets soft (A), then it develops cracks in the surface (B), then it begins to “fibrillate” (deteriorate and flake) (C), and finally it wears away to expose the surface of the bone (D). As a result, it loses its ability to act as a smooth, gliding surface. The cartilage doesn’t wear away all at once over the entire surface of the bone in a joint. Instead, it wears at different rates in different parts. So if you consider the surface of a ball bearing that was covered with Teflon, this type of wear would be as if the Teflon had pits and the surface would now be irregular (see the image below). Once the surface becomes irregular, the cartilage may undergo further damage. It may begin to thin out, eventually leading to the bones of the shoulder rubbing against each other (stage four cartilage loss). Many people think that arthritis is bone-on-bone traction in the joint, but in reality arthritis is the process that can lead to the bone-on-bone traction. It is impossible to tell how fast shoulder arthritis will get worse. Every person’s shoulder joint has different degrees of damage to the cartilage. Typically, when certain activities produce pain, it means that the cartilage is experiencing stress. Generally, the more painful the activity, the more likely it is to damage the cartilage and the shoulder joint further. There are several different forms of shoulder arthritis. Each may have different origins, and some causes of shoulder arthritis are still unknown. Osteoarthritis is also known as degenerative joint disease. It is often associated with wear and tear related to aging. It can also affect other joints besides the shoulder and is the most common form of arthritis. Rheumatoid arthritis is an autoimmune disorder, which means your body attacks your own healthy cells, which may include the lining of the joint. This inflammatory arthritis can be present in both shoulders at the same time. If your shoulder was fractured, dislocated or otherwise injured, you may develop post-traumatic arthritis. Rotator cuff tear arthropathy is a type of shoulder arthritis that can develop after a massive and prolonged rotator cuff tear. The four rotator cuff tendons in your shoulder wrap around the ball portion of the shoulder joint, holding it in place. If one or more of these tendons is heavily torn, this may cause the humeral head to rub against other bones and develop arthritis. Avascular necrosis refers to disrupted blood supply to an area of the body, which results in that area dying (necrosis). In the shoulder, the humeral head (the ball of the shoulder joint) may lose blood supply due to disease, traumatic injuries and other causes. Without blood supply, the bone will slowly collapse, becoming uneven and causing arthritis. Pain in the shoulder joint is the major sign of arthritis. It can be present in the front, side or back of the shoulder. Some people have pain even when they are not using the arm, and some have pain only when using it. Arthritis pain can occur at any time of day and can be present with or without shoulder stiffness. Often the pain is worse with lifting, carrying heavy objects or after exercising. The pain can often radiate into the arm or, if severe, can radiate down to the elbow and wrist. Stiffness of the joint is another sign of shoulder arthritis progression. You may experience stiffness as loss of range of motion in the shoulder. As the motion decreases, you may find that you can do fewer things with your arm, and these activities may be limited due to pain. Grinding, clicking or cracking (crepitus) may be felt since the surface of the cartilage is irregular with arthritis. It may or may not be painful. Sometimes the shoulder may “lock up.” Occasionally, because the surfaces are no longer smooth, you may feel the shoulder slide in certain positions. To diagnose shoulder arthritis, your physician will perform a physical exam and ask you questions about your symptoms and medical history. The degree of arthritis and the amount of bone in the socket can be evaluated and confirmed with an X-ray or, if needed, with a CT scan. The initial treatment for shoulder arthritis is medical (nonoperative) treatment. It often starts with range-of-motion exercises to keep the shoulder mobile. If your range of motion is not affected, then the goal is to prevent it from deteriorating. Loss of motion in the shoulder joint due to arthritis is often gradual and can be hard to notice. As the joint gets stiffer, the pain and the ability to be active may also worsen. It’s recommended to stretch for two to three minutes every day, whether you have loss of motion or not. Physical therapy for shoulder arthritis is typically not needed unless you are losing range of motion. Strengthening of the shoulder with arthritis is usually not recommended, as in some instances it could cause more pain. However, if exercises do not bother the shoulder, then they are perfectly fine to do. The second medical treatment is to avoid, within reason, the things that make the shoulder painful. Generally, anything that causes pain should be avoided, especially if the pain interferes with your life. If shoulder pain lasts for several days and wakes you up at night, it may be reasonable to question how important that activity is to you. For example, if you have pain while playing golf, it may be necessary to cut down to once a week instead of playing daily. Ice is your friend. Ice packs are great for pain and can be used once or several times a day if needed. You can use a bag of ice or a cold therapy pad that can be placed in the freezer and reused. The ice pack should be placed on the front, across the top, and on the back of the shoulder. It can be used for 20-30 minutes at a time. If the pain is waking you up at night, consider icing the shoulder before bed. Some people feel that heat is a better treatment for shoulder arthritis pain. Heat is often good for warming up the joint before stretching, but you should use whatever strategy provides the best relief. Medication can also be used to control pain, but all of them have their benefits and potential complications. Discuss your medications with your primary care physician or your surgeon to make sure you don’t have any reasons to avoid certain medications. Which medication can I use for my shoulder arthritis? You could start with acetaminophen since it has few side effects. However, it can affect the liver if used in high doses, so consult with your physician about the best dose. The next class of medicines that help shoulder arthritis symptoms are called non-steroidal anti-inflammatory drugs (NSAIDs). Most NSAIDs can be taken only when pain is present, providing relief on demand. If you need a more consistent pain relief, speak with your doctor. Also, NSAIDs should not be taken if you have a history of bleeding and ulcers, are on blood thinners, have kidney failure, certain heart diseases or other conditions. You should discuss these issues with your physician before taking NSAIDs. There are currently two types of injections that can provide pain relief for shoulder arthritis. The first type is cortisone shots. Typically, cortisone is mixed with a numbing agent that provides immediate pain relief and helps your doctor know if the injection is in the right place. Once the numbing medicine wears off, the joint may be sore until the cortisone kicks in. It’s important to ice the shoulder for a day or so after the shot. Cortisone shots don’t damage the shoulder, but most surgeons limit them to no more than a few a year in most cases of arthritis. Cortisone shots may increase the risk of infection if you undergo a total shoulder replacement soon after the shot. If you are considering the surgery, consider avoiding cortisone shots a few months prior. The other medicine that can help with shoulder arthritis is synthetically manufactured hyaluronic acid. It’s a naturally occurring lubricant in the human body. This liquid substance has been injected into arthritic knees for many years. This injection sometimes helps with the pain for up to two years, but it is unusual for it to take all the pain away for an extended period of time. The current recommendation is not to have shoulder replacement surgery within three months of having a cortisone shot in the shoulder. If you are considering surgery, it is best to avoid cortisone shots until you have discussed it with your doctor. When the nonsurgical treatments don’t work any longer, you may need surgery. Surgical options depend on your age and the degree of the arthritis. This minimally invasive procedure uses a small camera (an arthroscope) and surgical tools inserted through small incisions to “clean out” (debride) the shoulder joint. It is recommended for patients with lower grades of arthritis and is typically not recommended when there is bone-on-bone traction. If you have some cartilage left in the joint, sometimes debridement can provide pain relief. No bone spurs are removed during this procedure, as the spurs are the result of the arthritis and not the cause. This operation is considered a success if it relieves pain for 12 to 24 months. Although in some cases the pain relief may last longer, this operation is typically not a permanent solution for shoulder arthritis as it does not change the presence of the disease. Shoulder replacement is the preferred procedure for bone-on-bone shoulder arthritis. It relieves the pain of arthritis, and it has been shown to last for many years. A standard total shoulder replacement procedure replaces the ball and the socket parts of the shoulder joint with artificial parts. In a reverse total shoulder replacement procedure, the ball and socket sides of the joint switch places. This procedure can be done for many conditions, but it’s mainly used when there is a rotator cuff tear in the shoulder with arthritis. There are other types of shoulder replacements that are not as widely used today. One such type is a hemiarthroplasty — a procedure that replaces only the ball part of the shoulder joint. There is also an operation called a cup arthroplasty. It is similar to a hemiarthroplasty, except only the surface of the bone under the humeral head (ball) is removed. The area is smoothed and rounded, and a replacement piece shaped like a hollow half of a ball is placed on the end of the arm bone. Your shoulder specialist will help you determine the best treatment option for your shoulder arthrits.